Key signatures and how to remember them. Chris breaks down the seven major modes and how to apply them. The application of major seventh chords. The major 6th chord, how it is derived and how to play it. The minor 6th chord, how it is derived and how to play it. Chris breaks down the seven melodic minor modes and how to apply them. A simplified explanation of the theory of augmented chords. Chris talks about the much used turnaround that typically presents itself at the end of a song sequence. Chris discusses playing jazz guitar chord melody, in particular over two-five-one chord progressions. A simplified explanation of the theory of diminished and diminished 7th chords. Diminished ideas and the use over dominant 7th chords. A simplified explanation of the theory of half diminished chords. 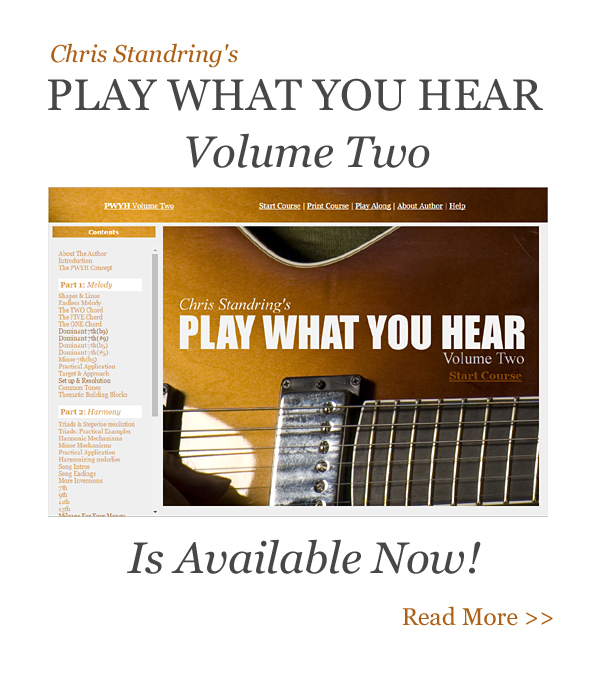 Chris shows you three effective ways to end a jazz standard. How to create some altered harmony in the most simplistic way. How to add even more altered harmony by simply moving phrases up in minor thirds. Spice up your melodic lines and give them an extra zing using target tones. Chris discusses how you can emulate those blistering lines that jazz masters George Benson and Pat Martino mesmerize us with. Adding an element of harmonic danger to a jazz guitar improvisation.